I switched my Monotone Mondag to next Monday for the cattails in my pond. If a beaver were to move in, the wonderful bulrushes would drown. Jolie photo en pleine explosion. Mary MacADNski: Like a spring firework! I love cumbungi, Mary...keep those pesky Beaver out! Mary MacADNski: I like them too having always played with them when young. Lovely photo's of these cattails. I've always loved them! Mary MacADNski: I played with them as a kid. They provided ingredients for mud pies. Mary MacADNski: The top one is easily recognizable. Others may not be. Wonderful presentation of these cattails Mary! Mary MacADNski: There will be more. Mary MacADNski: Tomorrow you really see the seeds. SAVE THE CATTAILS! I can see it now...and hope the beavers can read! When the cattails go to seed like that, they start looking like sheep. Mary MacADNski: I love this fluffy stage. It is like a coming of age. Go forth and multiply! I love these 'cigars' as we call them. These are wonderful pictures you took. Please explain what you meant with if the beaver were to move in the bulrushes would drown. You mean to say they will block the water from running through? Mary MacADNski: The bulrushes grow around the edges of ponds in shallow water. Beavers flood a pond and the water would rise around the shallow areas. Deep water would not allow them survive for another year. 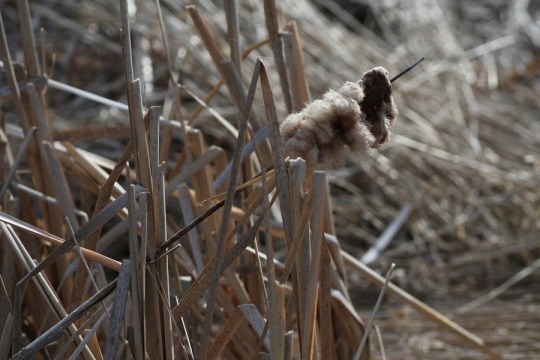 a wonderful photo - Ginnie is right: The cattails look like sheep. Mary MacADNski: More fluffy ones are upcoming. Mary MacADNski: Yes, and all my trees. Main picture is a great one. Mary MacADNski: It was immediately recognisable. Mary MacADNski: In my own back yard. Ha ha I love Monotone Mondag, great stuff Mary. Mary MacADNski: Next Mondag is posted. Mono works better for me. I've not heard of cattails before. Mary MacADNski: The authorities say that the British call them bulrushes.